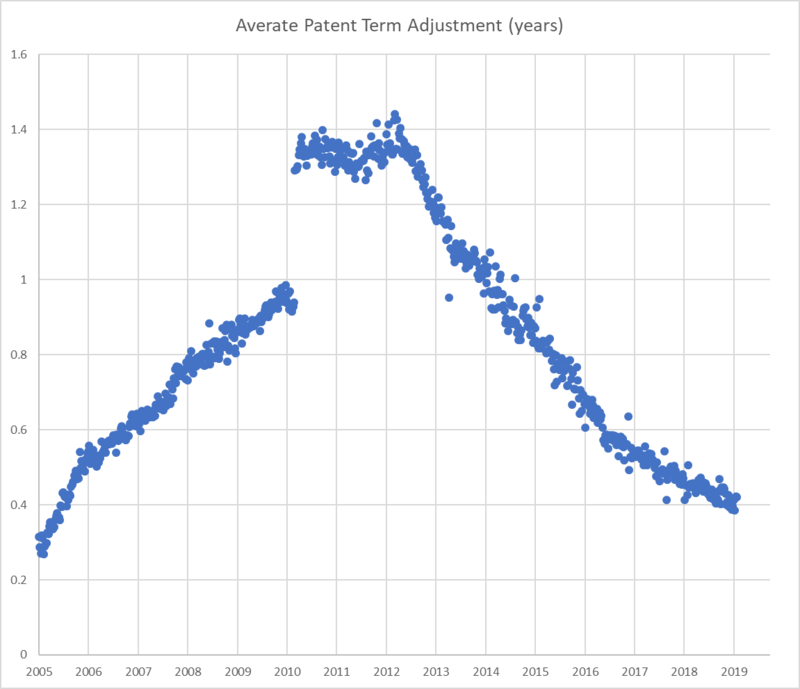 Patent Term Adjustment at 10 year low. Following-up on Yesterday’s PTA post, I wanted to run some numbers on Patent Term Adjustment. The chart below shows the average patent term adjustment for patents issued issued since 2005. The bump in early 2010 is due to a change in interpretation of the law in the Wyeth decision. If the PTA had been calculated consistently during this entire period, we would now be seeing the lowest values during the entire 13 year reporting period. In many ways, PTA levels are a good measure of USPTO timeliness and performance because they are based upon Congressional goals for patent prosecution, including (i) a first office action within 14 months of filing; (ii) responses within 4-months; and (iii) total pendency of not more than 3-years (regardless of the cause). One important measure not captured by PTA involves RCE filing because that filing cuts-off the three-year expectation. 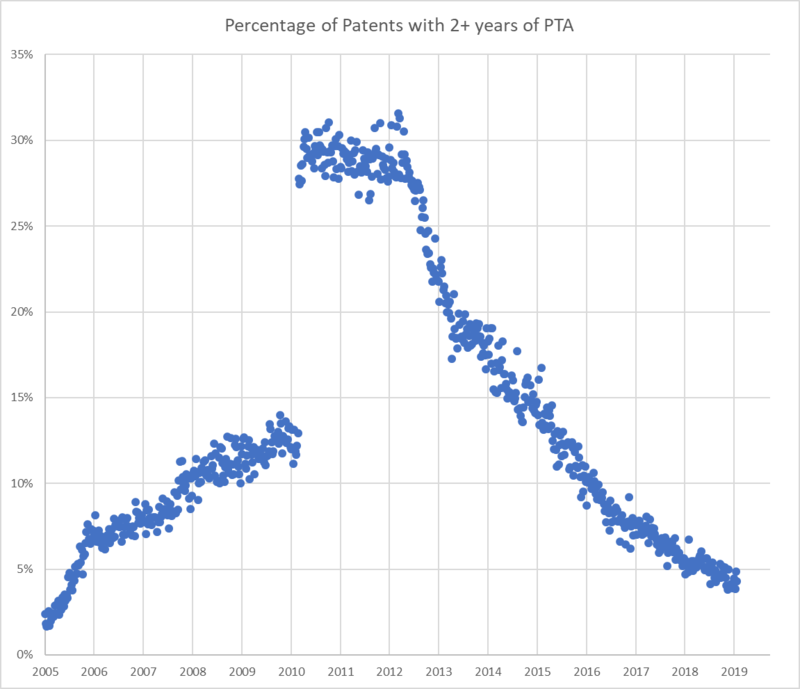 The second chart shows the percentage of patents with 2 or more years of PTA. Note that drop has been quite dramatic. Congratulations to the PTO. The largest PTA cases typically involve successful appeals. For instance, recently issued U.S. Patent No. 10,025,588 was given 13 years PTA. In that case, the examiner first rejected the claims as anticipated (reversed on appeal) and then came back to apply the same prior art as an obviousness rejection (again reversed on appeal). removing, by the at least one processor, redundant invocations of the at least one user-defined data type method in transforming the database query to the statement. So … how many Examiners out there are going to “volunteer” at the PTO when the checks stop coming? Presumably all the ones who voted for Perznit R@ cyst McDerpderp, which are guaranteed to be the least intelligent ones. But how many others? Gonna be fun watching the backlog grow. Maybe Fraud Iancu will pay them out of his own pocket. Those that want to stock up on completed cases they don’t have to turn in until the shutdown is over. Transforming a query! That’s ineligible subject matter. Oh but wait — this is a database query, which changes everything. Those types of queries are notoriously difficult to handle in dry conditions, given their tendency to crack. Must have taken years of research to figure out how to convert those data type methods into statements, given how data type methods almost always resist such conversion, especially when they are user defined. Seriously, infringe without fear. This claim is pure gar bage. Must all eligible claims be subject to dry conditions, tendencies to crack, or conversion resistance? What is your point? Other than the typical dust-kicking and dissembling that you do in regards to a form of innovation most accessible by the non-wealthy…. “Transforming” a “query” is an ineligible abstraction and “do it on a computer” changes nothing. a form of innovation most accessible to wealthy grifters and attorneys…. Once again: infringe that claim with impunity. It’s worthless. Ignore it. And ignore every logic claim that flows out of Fraud Iancu’s fever swamp. You’ve already demonstrated your extreme ignorance and lack of intelligence, especially concerning this type of technology. So we can safely assume no one will be taking your advice here. Converting a portion of a query into a statement? That’s “technology”? It’s a functional description of logic applied to data, which is an ineligible abstraction. That’s not “technology”. Certainly it’s not patented technology. Not my fault is Fraud Iancu manages to con your clients out of their money (with your help). By the way: playing the “you don’t understand the tech” card is a guaranteed fail, especially when there is no technology recited in the claim except old technology (e.g., programmable computers, which I was programming 40 years ago). Next thing you know you’ll be telling everyone that deciding whether or not to stop and let the kitten cross the road is “technology.” Stop b0ttom-feeding. Grow up. HAHAHAHAHAHA. You were programming 40 years ago…. Right… For some reason I doubt this is true. I can’t understand why. Maybe it’s time to enter the 21st century old man. You were programming 40 years ago…. Right… For some reason I doubt this is true. You must be really young. When do you think kids in the United States were first exposed to programmable computers? MUCH much later than they were exposed to Protons, Neutrons, and Electrons – that’s for sure. Jesus bruh you’re old. Also I just got mistaken for a 23 yr old when I’m shaved lol. I’m old enough where I should be turning conservative, according to legend. But that’s not happening. I hope I die before I get that old, as some really old rock band used to say. Sadly, Bguy, this blog itself has shown sycophants that drink the Kool-Aid that Malcolm peddles. Or, Billy, you and your bff could work together all night on a coherent argument demonstrating that something I wrote in 3.1.1.1.1 is false. That would require you highlighting the specific statement you are addressing, and then making a series of direct logically-linked sentences. You have extreme difficulty with that sort of thing. I would suggest practicing on another commenter who routinely makes false statements (Night Wiper would be great place to start for a little sapling like yourself). Good luck! You’ll need a lot of it. What’s the difference between applying logic and pure logic? No need to “work all night” and your well-wishes of “good luck” are as unneeded as they were insincere. The rest of your post with its misaimed (and false) ad hominem is simply (and rightfully) ignored. Pure logic? As opposed to the contaminated kind? Try not to pretend that we have not had this discussion previously. That would require you highlighting the specific statement you are addressing, and then making a series of direct logically-linked sentences. Not sure why you are waiting. You’ve been given these things repeatedly and all you do with them is run away from them. But a method of transforming a yard into a garden is an eligible reality because MM can see the dirt and the seeds, but cant see the query and the data. The method of starting crops planted from 5 seed in a growing season in order to gain an advantage in growth of the crop plants over weeds and other volunteer vegetation which comprises breaking and aerating the top soil and leveling the surface of a tract of ground whereby weed seeds are brought close enough to the surface to germinate, thereafter depositing crop seeds in the said ground in separate hills of small area without substantial disturbance of the soil over the remainder of the area of the tract, and invariably before sprouting of the crop seeds, flaming the surface of the tract to kill the sprouted weeds and other volunteer vegetation over the entire area in which the crop seeds are located, whereby the crop plants gain a growth advantage over weeds and other volunteer vegetation. An overlay of Patent Office Directors for the timeframe of the graphs may provide an interesting point. It is interesting to see the article admit to the effects of Appeals, one of the three main decks of the good ship Titanic (the other two decks being the queue shown in the graphs and the not shown queue of RCE backlog). One is left wondering what the picture would look like if RCEs were not sliced away. Given that the timing aspects were part of the guarantee of action for applicants to be able to judge whether or not to abandon prior to publication (for which the adjustment of time post-grant is a weak substitute), it should be emphasized MORE that the option of non-publication should be a default option. Especially (but not exclusively) for those who will not be filing in a foreign Sovereign. Even those filing in foreign sovereigns may want to consider filing a US parent application with a non-publication request and docket a review of intentions/actions at the later point in time for which rescinding of the US non-publication request is provided under the law. On another thread, Random (rightfully) reminds us of the presence of this type of “secret” prior art – but the tone there is an entirely negative one. One must remember that the very existence of this type of “secret” is premised as part and parcel of the underlying Quid Pro Quo bargain, and should be viewed as a positive feature for applicants (and the system). One of the reasons for the “explosion” in the first place was an Office attitude of “we got ours” (publication), so you will get yours (examination and grant) when we decide to get to it. This was an immediate outflow of the change in the Quid Pro Quo deal with publication prior to grant as a default. This was a huge denigration for the US system, and a p00r choice (one made with a “let’s be like the rest of the world” policy infiltration). And of course, the anti-patent set here will never admit that it was Kappos who came in and said, enough is enough, let’s clear this mounting backlog.